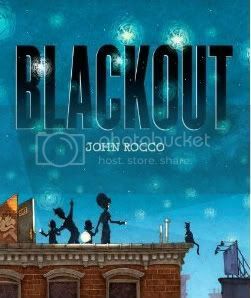 An urban, multi-cultural family spends a hot summer night glued to the tv set, computer... until the power goes out. The book is in somewhat of a comic book format, with large panels and a few speech balloons. There's a generous use of cross-hatching, and what looks like digitally-added color. I loved the hidden little details, such as Thomas Edison's portrait looking disapprovingly on as the protagonist initially settles in for a night of video games. Once the lights are out, the book switches to a subdued palette of mostly blue. Forced to hang out together, the family tries playing with a flashlight making shadow puppets on the wall, until they decide to go up to the roof, and watch the stars. Then they head down to the street where's there's a block party atmosphere. An ice cream vendor is giving away ice cream (I assume before it melts) and kids play by a splashing fire hydrant. When power is finally restored, "everything went back to normal... but not everyone likes normal." and here we see the family purposely turning off the lights, and playing a board game together. Personally, I grew up without a television, and without electricity for quite some time, but I remember when I was very little and our family still had electricity. The lights went out one evening, and we were forced to gather around by candlelight, playing card games. In part, because of how my parents saw how much more wholesome our lives were without it, they decided to forgo having electricity altogether. These days, I'm so digitally connected... I know going without my computer would be a bummer, but I don't have a terror of how I'd survive without electricity, since I know from personal experience how possible it is. This book would make a great bedtime story, and hopefully will inspire people to try out a night off-the-grid. It's good to at least take some time off the usual electronic games. This is a perfect opportunity to bond.